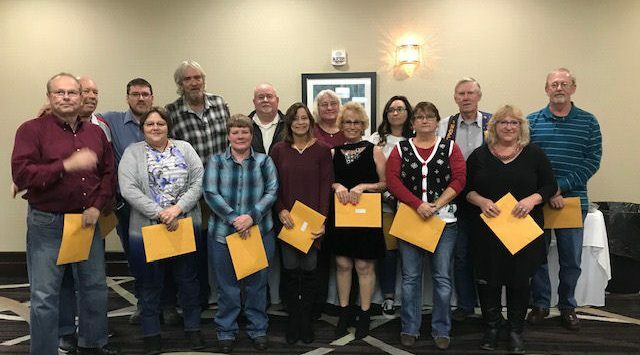 A group of the best bus drivers in Salina have been honored. OCCK honored 27 drives with more than 85 years combined of safe driving as recipients of the 2018 Driver Safety Recognition Awards. According to the organization, the awards program is designed to distinguish and honor OCCK Transportation drivers who have proven their skill in avoiding accidents and consistently perform their jobs in a safe and efficient manner. Recipients exemplify professional driver standards and a commitment to safety. One Year Awards went to Richard Anderson, James Bean, James Brockway, Mark Garner, David Hicks, Elizabeth McCormick, Timmy Morris, Clark Shenk, Dennis Smith, Mark Stokes, and Melinda Wolfe. Two Year Awards went to Tawnie Heard and Mike Nicholson. William Arehart, Terrell Green, Shelley Hanchett, Trudy Morton and Kenneth Waldman received Three Year Awards. Jaimie Wintholz received her Four Year Award. Debbie Dragoo and Susan McMahan received their Five Year Awards. Jason Tieking received his Six Year Award. Rena Bishop, Joseph Dickinson, Timothy Dickinson, and Daniele Whitaker received Seven Year Awards. One driver received an Eight Year Award: Larry Holmgren. Photo: Front Row, Left to Right, Kenneth Waldman, Melinda Wolfe, Debbie Dragoo, Rena Bishop, Elizabeth McCormick, Trudy Morton, Daniele Whitaker. Back Row, Left to Right, David Hicks, Joseph Dickinson, Timothy Dickinson, William Arehart, Shelley Hanchett, Tawnie Heard, Larry Holmgren, Mike Nicholson.